Noted cat lover and "Glee" actress Lea Michele is Nylon magazine's September cover girl, sporting a sparkly pair of cat ears to convey her kitty pride. The star's feline turn is significant, in that it pushes the cat ear fashion trend even further mainstream, showing that it's ok to wear the headbands as an everyday accessory, and not just on Halloween. After last year's explosion of cat hats, innovations like the Necomimi Brainwave Cat Ears by Neurowear and the popularity of a cat-ear inspired hairstyle sweeping the streets of Tokyo, have all lent a paw in igniting the cat ear craze. World renowned Parisian hat maker Maison Michel, no stranger to whipping up quirky (and expensive) feline inspired chapéus, has led the pack, with a staggering $1,290 cat headband, constructed out of wool-crepe and embellished with faceted resin beads and glitter. Elsewhere, European retailers are making the trend more accessible, offering an array of styles at street ready prices. 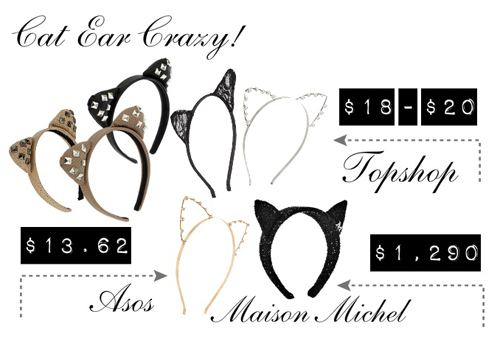 The ears Michele models on Nylon are on sale for $13.62 from ASOS, while Topshop is offering pearl, lace, and studded designs, all for $20 or less. (Husband) "Don't even think about it!"